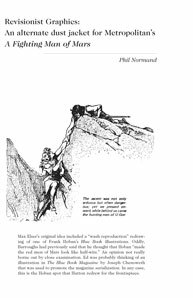 On this page are a few of the articles I've written in the past about various subjects of interest to ERB collectors. I'll be adding more later, so check back from time to time. These files are in PDF form and will open in a separate window. You can download them to print out for your collection if you wish, but you cannot publish them anywhere without my permission. Thanks. If you need the Adobe Acrobat Reader, go here. 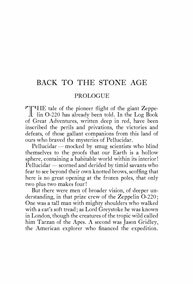 Back To The Stone Age: The Prologue— Print out duplex, trim and fold. Insert into your book. Revisionist Graphics: A FIGHTING MAN OF MARS Alternate Dust Jacket— How the jacket would have looked if the publisher had designed it his way. 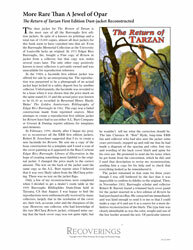 The Making of a Replica— How the 90th Anniversary TARZAN OF THE APES letterpress dust jacket was produced and printed. 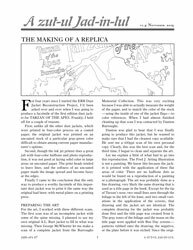 Reprinted from ERBAPA #87. Contents copyright 2017 Phil Normand and Normand Design. Site designed and managed by Normand Design.